Ever end up talking sports with someone who isn't into sports? You sound kinda crazy. Suddenly, it seems ludicrous to invest so much time and effort (and money, lets be honest) into something that you have absolutely no...1) control over, and...2) legitimate claim to share in the experience with the people actually involved. When I tell these non-sports people that I run a Michigan football blog – as sometimes comes up in conversation, I feel that times ten. "Really?!" they say. "So, like, what do you write about?" It's like trying to explain trigonometry to a coffee mug. They just can't conceive of why a seemingly reasonable human being would do such a thing. "You write a blog about Michigan football? So, like, do people read it?" I try to explain this weird subset of spectator that has been invented over the last few years. "I'm just a fan who runs a website that talks about Michigan football" I say. "But I have media access – which kinda somehow legitimizes the whole thing...I guess." Look, I have no idea. I watch games, I see things, I write about them. After that, it's up to you guys. I also tweet a lot. As spectators, there's really nothing we can do to determine the outcome of a game. Regardless of which team of which sport we root for, we are essentially powerless as we sit and watch events unfold before us or on a television screen. Oh we can scream and shout and laugh and cry, or we can be still and let it waft over us. Either way, we're simply just...there, not really doing anything, as things happen in front of us to either be happy or not happy about. WTKA caller urges Hoke to wear a headset "even if there's nothing coming thru"
Sports can make a reasonable man run the entire gamut of human emotions. Joy, anger, pity, pride, shame, elation, disappointment, confusion, etc. As Michigan fans, we've become accustomed recently to a very unique emotion – embarrassment. The on-and-off-again struggles of this program in recent years have left our Maize and Blue hearts callused. They say time heals all wounds, but when events like the Akron game rear their ugly heads, those outcomes can rip that toughened skin away and reveal very fresh and vulnerable wounds. It's not easy to deal with embarrassment as a sports fan. The immediate reaction is to get angry and blame someone or something. If you've wandered into a Michigan internet message board the last two weeks, you know what I'm talking about. After the initial anger subsides, confusion takes over. How does Michigan find itself in this position seemingly so frequently these days? Why can't Michigan play a wildly inferior opponent and put them away like everyone else seems to do all the time. This is Michigan, fergodsakes! But that's just it. Michigan is Goliath, after all. "Hey, those Appy State guys beat Michigan, so why not us? "...says every so-called mid-major opponent that wanders into Michigan Stadium. And honestly, good for them for thinking that way. They should...they're supposed to. 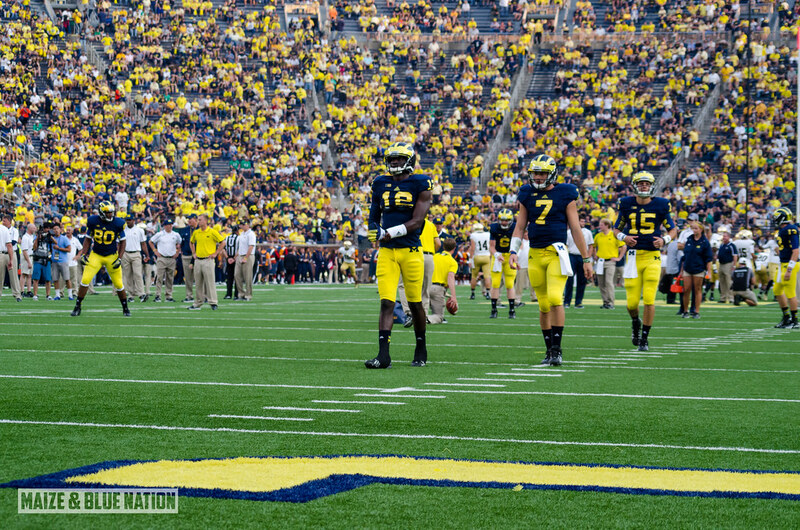 But the problem is that Michigan still fails to realize sometimes that they have a huge target painted on their backs. The last two weeks, Michigan thought all they had to do was show up. For Akron and UConn, playing Michigan was their Super Bowl. I can guarantee you that there are young men on both of those rosters simply because Michigan was on the 2013 schedule. They're all, literally, lining up to be the next Appalachian State. Even Appalachian State, who Michigan opens with next year. 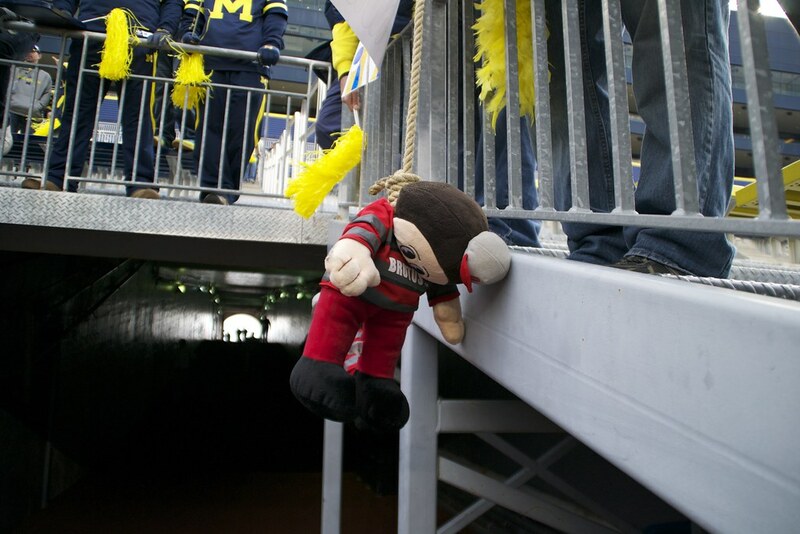 Team 134 is full of potential, but they have their weaknesses...we knew that going in. We know that from the first four games of the year. In 2013's Big Ten, much like every year, the only thing standing in the way between Michigan and glory is Michigan. There's no one else in this conference that they can't beat if they want to. These two bye weeks are perfectly timed. Having 4 games, then 3 games, then 5 games creates an ideal arc to the season. Two perfect chances to step back, regroup and reevaluate where they are, and what they need to do. This bye week comes when Michigan needs to focus in on doing some of the little things better. A massive overhaul slight reshuffling of the offensive line could be in order, I would think. Possibly a new center...who used to play left guard? And maybe a new left guard...who used to play right tackle? I dunno? The consensus from everyone who's ever watched, played, thought about or even heard of football is that giving the ball away an average of twice a game will absolutely destroy your season. So stop doin' it, man. I know it's easier said than done. And I realize that the bulk of the turnovers stem from one guy. So I don't think it's a systemic problem that needs to be addressed with valuable practice time. I think the cure for Devin is just spending more time in watching film and realizing that he's not the only guy out there. So, best case/worst case from here on in? Best Case: Michigan cures it's deficiencies, mostly just the mental breakdowns, and goes on to win every game, beating Ohio State twice. They play whoever in the national title game and we all drink champagne as Michigan is crowned the BCS Champion with on-field confetti and all that stuff. And since success breads success, they land a certain top-rated recruit...maybe two...en route to signing the top class in the country. And then again with the champagne. Worst Case: Michigan finishes with 6-7 wins, basically splitting the next 8 games with probable losses to Penn State, Michigan State, Nebraska, Northwestern and Ohio State. Maybe even a loss to Indiana or Minnesota or something. They back into a non-New Year's Day bowl – which they probably lose...and the program slides into another slump of mediocrity. But even if that pesky turnover margin improves dramatically, neither of those two scenarios are probably likely. But if recent history serves, an unequal combination of the two can and probably should be expected. Other than that, that's it. That's all I got. As someone who's watched more football than I care to even contemplate, that's the only logical conclusion I can come to after seeing what I've seen the last 4 weeks. So enjoy your bye week, folks. Watch some other games this week, there's some good ones. Spend time with your loved ones. Tend to those fall yard duties. Finish that home improvement project that been sitting there since it August. Or just sit back and do nothing. As a Michigan fan, you've earned the right.